West Lafayette, Ind. — Drone operators struggling to fly the multi-propeller device and take pictures simultaneously could soon have a much simpler method to steering flight. 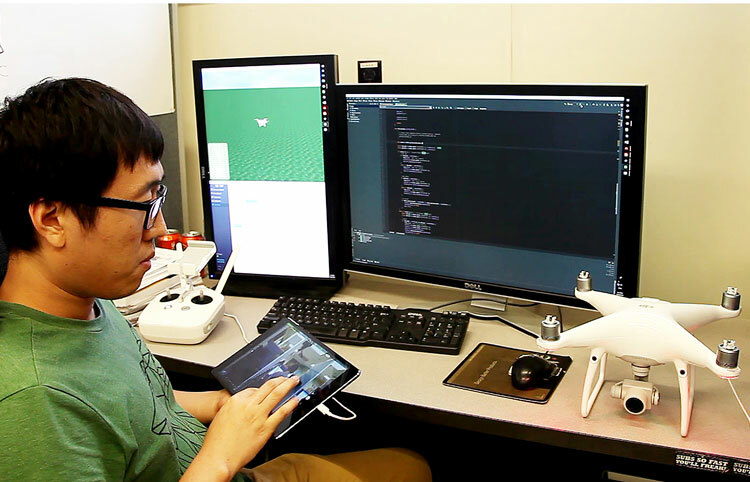 Bedrich Benes, a Purdue University professor of computer graphics technology, and doctoral student Hao Kang collaborated with corporate researchers to develop a touch-screen method to navigate and take pictures with drones. FlyCam uses one- and two-finger drags across a smartphone or tablet to control the drone as it accelerates or turns and takes images. The drone moves forward or backward along the camera’s axis with single or double taps to the screen. Traditional, more complicated drone controls utilize dual joysticks for the drone navigation as well as an additional joystick and gimbal — a pivoted support that allows rotation on a single axis — to control the camera. FlyCam was tested using an Android system. Fliers worked better when using a tablet, which allowed for larger movements and better control.